Want to ride fast? If you don't answer with a "HELL YES!" then go read something else. One of the keys to riding fast is to set up your suspension for yourself. The stock suspension setup usually comes setup for a 170lbs rider on a motocross track. Personally I don't even come close to this. The trick to suspension set up is to be methodical. What your looking for in off road riding is to have the suspension soft enough to take the millions of bumps that you hit. But it still has to be stiff enough to prevent the bike from bottoming out. Also do note that the pro's customize the suspension for each individual track. You don't have to do the same unless the conditions change radically. To get the most out of suspension testing, you should make a plan for testing. Try to be methodical about it. Also don't forget the rest of the riding area, you don't want you're suspension dialed in for just one bump and neglect the rest. 1.) Change only one adjuster at a time. Except for the forks, do both sides at once. 2.) Make only small changes. Some people I know will go five clicks to make a noticeable change, then work in when they get close. 3.) Keep track of the changes. 4.) Use caution and avoid dangerous situations until you have mastered the bike. The first measurement you should take is the preload or the sag. Beginning measurement: Place the bike on a stand, so that the rear tire is off the ground. Measure the distance between the rear axle and a fender mounting bolt. This will be your reference (zero) line. Bike Free Sag: Place the bike on the ground. Then measure the distance between the same two points you measured earlier. The average sag is about 15mm. If you have no sag then back off the preload adjustment on the shock. (The ring at the bottom of the fork spring.) If there is too much then tighten up the preload. Race Sag: Get a friend to hold your bike while you sit on your bike (in full riding gear) and measure the distance between the two points. Subtract this from your free sag measurement and you get you bike's sag. The race sag is usually between 85 to 105mm. Motocrossers would be at the upper end of that limit while off road racers would be at the lower end. 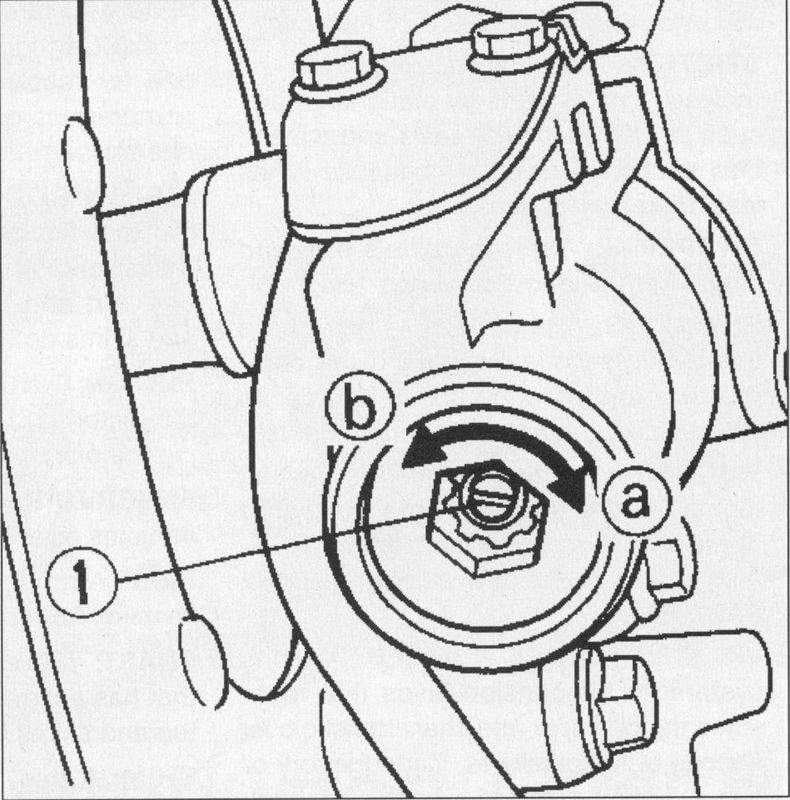 Correct sag is actually about one-third of the total rear wheel travel. 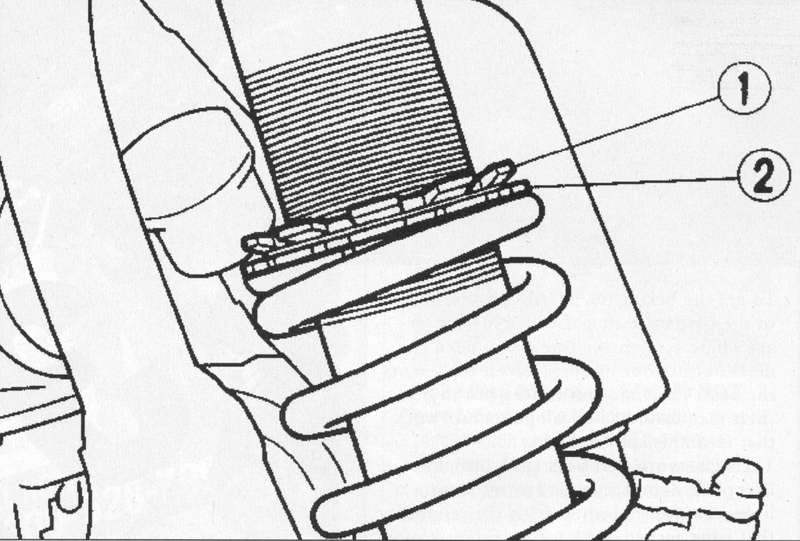 The point of this exercise is to see if your shock spring is correctly set up. Use the preload adjusters the same way as you did before to dial in the race sag. The rear shock controls the rear tire and its ability to get traction. Too soft and the tire will kick up over all sorts of small bumps. This makes power delivery a little abrupt. Too stiff and you do all the shock absorbing as well as make the bike kick up a lot under braking and put more weight on the front forks. If the spring is near the top of the preload then you will need to get a stiffer spring. If its down the near the bottom then you need to get a softer spring. A trick when adjusting the spring is to loosen off the bottom lock ring and then spin the spring into place along with the top lock ring. Once you have the suspension working properly, you can go riding. (Like I need to tell you.) When you ride take notice on how the bike handles over the bumps. You should try to ride over a wide variety of terrain so that the bike doesn't become dialed in for a specific section. Generally you're looking for a nice smooth operation. But if trouble hits, here are some things to look at. This is when the forks dive too much when braking for turns. Generally the forks are too soft, and can't handle the weight shift when braking. This can be caused by the forks spring rate being too soft, too little preload (the metal tube at the top of the springs, inside the forks), compression damping is too soft, or the compression clicker is turned out too far. This is a lovely feeling is caused when the forks action is too stiff or unresponsive. Your problems may be due to the low speed damping is too stiff or the spring preload is too great. This is an even better feeling which may be caused by soft forks again. It's caused by tire pressure being too low, steering head is too loose, the fork springs are too soft, (or sacked out) the spring preload is too little, of the rebound damping is too slow or too stiff. This is when you feel the jolts from the front wheel going over square edged bumps. Again here is a problem due to overly stiff forks again. This may be due to the fork oil level being too high, the compression damping is too stiff, the fork spring is too stiff. The fork spring is too soft, the oil level is too low, the cartridge bushing is too worn, or the compression adjuster is turned too far out. Wrap a zip tie around the fork leg to determine if the fork is actually bottoming. It is normal for the fork to occasionally bottom. The shock is too soft and will compress when you pour on the gas due to a tightening of the chain. Also the spinning of the back tire over the terrain will cause the tire to kick into the air more easily. This is due to the rebound damping is too soft, the spring sag is too low, the rebound adjuster is turned too far out. This is another fun sensation. The back tire will not respond to the terrain because the shock is too stiff, and will not follow the ground. The shock sag is too much, the rebound damping is too stiff, or the compression damping is too stiff. Modifying the suspension can be an expensive proposition. The good news is that the stock springs should be good enough unless you're 10 kilograms (20 lbs.) over or under the weight of the manufacturers ideal rider, or ride very aggressively. The manufacturers "ideal" 250 cc or larger rider usually weighs 75-85 kilos (150-170 lbs.) while a 125 rider will clock in at 65-80 kilos (130-160 lbs.) and a mini rider will tip the scales at 40-50 kilos (80-100 lbs.) If you fall out side these ranges then you might consider buying new springs. Also note the amount of static sag your bike has. If it's 12mm or less, you might be using too much preload with too soft a spring. If the bike sags more that 25mm then the your spring is too stiff. Stiffer springs are the best solution for frequent bottoming. In most cases a spring that is one step stiffer will solve the bottoming problem without causing a severe change in suspension performance. Stiffer springs prevent the suspension from operating in the final centimeters of travel. Also the stiffer springs make way for lighter compression damping and a lower fork oil level, both of which provide for a plusher ride. Oversteer is the bike's tendency to steer too quickly and tuck under in soft soil. In other words the bike steers too much for a given input. This may also be caused by soft fork springs which allows the fork to operate near the final centimeters of travel. This in turn steepens the fork angle and shortens the wheelbase, making the bike a little bit more unstable. The springs should be suspect when other methods to raise the front end have failed, such as lowering the fork tubes in the triple clamps or increasing the sag. Understeer is the opposite of oversteer. It's the bike lack of response to steering input. The stiff springs keep the bike's front end too high. Consider getting softer springs when other methods have failed, such as raising the forks in the triple clamps and reducing the sag. If the all the clicking in the world can't get your suspension to where you like it, you do have the option of revalving your suspension. 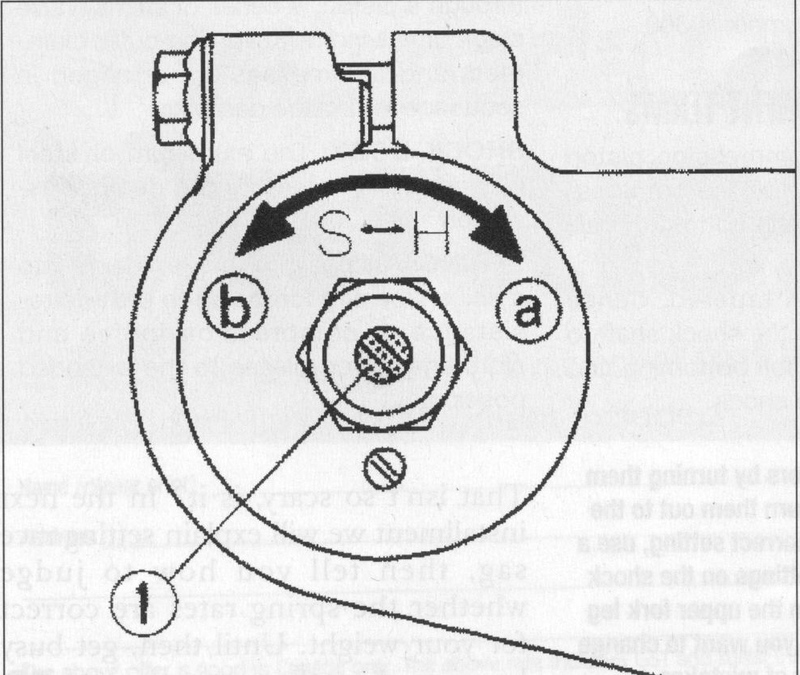 A valve in the suspension is a series of washers that allow oil from one part of the suspension to another. Change the size, thickness and arrangement of these washers can change the behavior of the suspension. Since the amount of oil that the valve pass is much greater than the adjusters, changes to the valving has a much greater effect. I would consider it, if your were 15-20 kilos (30-40 lbs.) over the typical weight, you ride in some extreme conditions or your bike was being used for something other than it was designed for. Such as a motocrosser being used for off road racing. Even though a fork rebuild can be a do-it-yourself project, it would be much better to get a professional to do it since you get his expertise along with his labor. It would be best to exhaust every other option before sending your suspension out for work. When you do send it out, keep these things in mind; Find a tuner that knows your bike and the riding conditions in your area. Be accurate in describing your riding conditions, skill level and types of terrain that poses problems for your suspension. A good tuner can provide the results you want, but can't read your mind to know what you want. So this may seem like a lot of information to digest. Keep in mind that a proper suspension setup can make you go faster. It can absorb the bumps and keep your bike under control. This means you have less work to do and you can go faster for longer. The basic idea behind changing the oil levels in the forks is simple compression. The more oil there is, the less air volume. And with less air volume, it become more difficult to compress. This make the final few inches of fork travel a little bit stiffer and provides some bottoming resistance. Suspension is the key issue for a rider to think about. The best engine in the world is useless with out a good suspension setup. The suspension allows the rider to maintain control of the bike and lets the engine put power down to the ground .